New Jersey Criminal Justice; Reform or Regress? A new report updating New Jesery criminal justice reform implemented in 2017 has been provided to the Governor and the Legislature. So called reforms were implemented in an effort to improve the bail system. How are the “evidence-based, scientific, statistically validated algorithmic risk assessments” performing? How are the hundreds of government employees hired to monitor those released performing? Hundreds of millions of dollars later, bail performance has declined while cost went up millions than before the “reforms” were implemented. The purpose of bail is to ensure defendants attend all their court dates and do not commit more crime while on pretrial release. 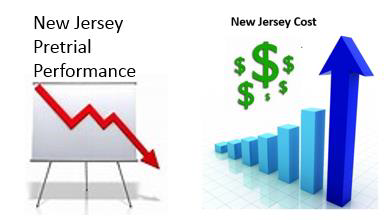 New Jersey fails in both categories as noted below. The new reform system is going broke. Beginning 2020, the reforms implemented will deplete the entire funding source forcing the legislature to turn to the law-abiding taxpayer to pay the bill. Though those who advocate for change tell legislators it will be self-funded or even save money, it always falls on the backs of the taxpayer. In his report to the governor and legislature in 2015, Glenn Grant, stated “Application of a risk-based system has the potential to reduce taxpayer costs as the system reallocates resources away from housing defendants pretrial in county jails to supervising them in the community. It costs much more to incarcerate than to supervise defendants.” In addition, the New Jersey Supreme Court increased fees to pay for the new system. According to the new report “Since November 17, 2014, the Judiciary has collected a total of $171.2 million from the authorized increase in court fees.” If it reduces taxpayer cost, why is it going broke and why do taxpayers have to pay more to support the reform? Simply, it is government speak that no business or family could operate under and survive. Ironically the $171 million has been paid by the same “poor” individuals bail elimination advocates said was unfair to charge them. The “poor” are still paying. Reform did not eliminate cost to the “poor”. It may actually have increased the cost to the “poor”. In addition, many more defendants regardless of whether they are indigent or not, now choose a public defender according to Francis Koch president of the County Prosecutors Association in New Jersey. Even more taxpayer expense. However, increased Public Defender was omitted from the report. Prosecutors filed detention motions against 49% of all defendants booked into jail. It is unknown how long those individuals waited before release as the report conveniently left those statistics out. Second, if the risk assessment tool (RAT) is accurate, why would prosecutors file for detention in half the cases? Were the risk scores high? If so, why are those defendants being released? It is certainly not in the interest of public safety. The report noted that the risk assessment works. 62% of defendants who scored a “6” (extreme risk) committed another crime, many violent, after release. Why would an extreme risk defendant be released? It is certainly not in the interest of public safety. The report went on to note defendants with a “violent crime flag” who were released were three times more likely to commit another violent crime. How many defendants fell into the extreme risk category and why were they released? The purported purpose of the “risk assessment” is to provide the necessary tool to a judge to hold defendants accused of heinous crimes. Are judges ignoring the scores? If so, is there a confidence problem with the assessment? One of the first statements in the report was “CJR is working as intended.” While the report notes some much needed and good improvements, spending far more than budgeted is certainly not working as intended. Nor is a higher pretrial failure rate. The one positive that the CJR can point to is there are fewer defendants in jail. However, fewer defendants in jail was only due to massively increasing the number of summonses in lieu of custodial arrest. That could have been done without any CJR and without any pretrial expense. The report did not provide separate data for those released on a summons. One other stated purpose of the need for reform was to reduce racial disparity. The report noted there was no change. 54% of the jail population was “black” prior to reform and it is still 54%. Did New Jersey implement reform or regress? Based on higher failure to appear rates, higher reoffend rates, and hundreds of millions of cost, it is clear New Jersey has regressed. This entry was posted in Bail Reform and tagged bail, bail bonds, bail reform, bail reform failure, bail system, bail Tampa, cash bail, Color of Change, criminal justice, district attorneys, Facebook, george soros, Google, Koch Brothers, Marshall Project, Pretrial, Pretrial Justice Institute, prosecutors, Right on Crime, risk algorithm, risk assessments, Tampa bail, Texas Public Policy Foundation, Vera Institute. Bookmark the permalink.